Leighton Town finally got back to winning ways as they beat Potters Bar 2-0 at Bell Close on Saturday. Craig Bicknell’s men were back in action after 12 days without a game due to various postponements due to the weather. Leighton set the early pace and came close when Billy Lobjoit forced Mike Underwood into an early save. Phil Draycott should have fired Town into a 16th minute lead when he found himself facing an open goal but his shot went wide of the post. Two consecutive saves from Town keeper Zaki Oualah denied Josh Hutchinson and Chris Doyle as Potters Bar came back into the game. The game ebbed and flowed, but Town had the better of the first half chances. A great ball in by Billy Lobjoit, found the head of Tyrone Taylor, and he tried to head the ball home but Underwood managed to get his fingertips to the ball and force it over the bar. Danny Watson then spurned a great chance to put the home side ahead, he too missing an open goal. With the scores level at the break, Leighton were hoping those missed chances wouldn’t come back to haunt them. Draycott and Billy Lobjoit both tested the Potters Bar keeper from range, but he was proving tough to beat, getting down low to keep them out. But it all came together in the 72nd minute for Leighton, when Draycott out-muscled his man to roll the ball neatly past Underwood to put Town into the lead. With 16 minutes to go, Lobjoit was replaced by Claude Senla, and it wasn’t long before he made an impact. 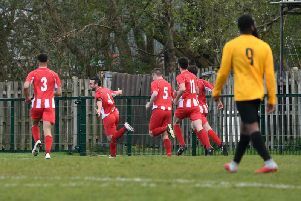 Tyrone Taylor missed Town’s third open goal of the match, but Senla made things a lot more comfortable for the home side when he doubled the lead with four minutes to go. A great ball in by Taylor found Senla and he calmly slotted the ball straight past Underwood, sending Leighton into a 2-0 lead. Oualah was determined to keep a clean sheet, but despite making a good last minute save, needed Gary Ridgway and Christian Lester to clear Potters Bar’s rebounded effort off the line. Senla could have put icing on the cake deep into stoppage time when he attempted to lob Underwood, but it sailed over the crossbar.